With my knee in its healing phase there’s not a lot for me to do outside of personal rest and home PT. For whatever reason I started to binge watch the original series Star Trek on Netflix, the series I came close to memorizing back in the mid-sixties when I was in the equivalent of middle school in Atlanta, Ga.
As a kid I’d gotten a small reel-to-reel GE tape recorder one Christmas, and I quickly pressed it into use recording the audio from each episode. I eventually had two stacks of tapes, one for season one, and one for season two. I never recorded season three; after spending one evening watching “Spock’s Brain,” I never turned Star Trek back on again because that episode was so bad. I spent the rest of the third season replaying my audio tapes, imagining the visual portion of Star Trek while the audio and music played from my tape player. After the original series was canceled I concentrated on Apollo up through 1972, when I graduated from high school and headed off to college. Those tapes got recycled into other recordings, and eventually into the trash when they were worn out. Over the years that’ve followed I’ve watched some of the movies (“The Wrath of Kahn”), some episodes from the spin-offs like Next Generation, and even gone back to watch the occasional rerun of the original series. To this day I still can’t watch “Spock’s Brain” or any of the third season episodes. These past few days were an opportunity to kill some time by binge watching TOS. I’ve had a Netflix account now for years, starting back when you got physical DVDs in the mail. The physical media’s long gone, but I still stream. So I fired up my iPhone 6s+, pulled up the Netflix app, and went slumming through all those old episodes. The version of TOS that Netflix has are the updated episodes where CBS went back and redid nearly all the old special effects. Planets really look like planets, especially when that planet is Earth (“Tomorrow is Yesterday,” “Assignment: Earth”), the spaceships were cleaned up, as were the movements of ships in space. With all the science fiction that has been produced since TOS first aired, it only made sense to update the effects. And I certainly appreciated those updates. The only problem is that those cleanups made all the episodes look that much worse for their age. What was entertaining and exciting for a middle-schooler in the 1960s now seems worn, frayed around the edges. The plot holes are too obvious and too numerous to mention, cause and effect too silly. I grew up during the period of Mercury, Gemini, and Apollo, watching real astronauts fly into space. It was watching real rocketry that made me believe we might have something like Star Trek in the future. When it all got shut down and replaced with the Shuttle, Star Trek became part of the “kid stuff” I left behind. Along with a lot of other silly Hollywood science fiction. I’m glad I got a chance to skip through all those old episodes. I think I finally got the very last vestiges completely out of my system. The underlying Borg cube itself was created by a very talented graphic artist who was either a student or working (or both) at the University of North Carolina at Chapel Hill (computer graphics, computer art?). He’d been creating a series of Star Trek models, and then setting them up in a series of beautiful visualizations which he’d posted on the Web. That Borg cube is one of his works. Unfortunately, having grabbed this back around 2005, I no longer have any idea who he is or where he’s currently at. I would very much like to know, if for no other reason than to provide proper attribution. I found the Microsoft logo on the Microsoft site as one of their official logos in SVG format. It was available for download, so I downloaded that. 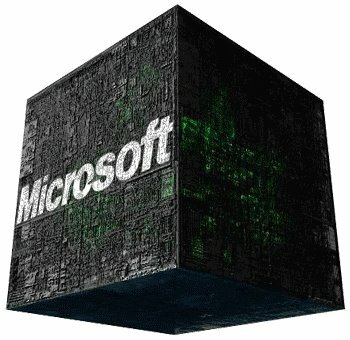 Using Photoshop and layers, I put the Borg cube in the lowest layer, then put the logo on the next layer. I then adjusted the logo in size and location, adding transparency to the logo, so that it appeared to blend into the side. Export to JPEG, and post. Somewhere in all my stuff I think I still have that Photoshop file, but I can’t find it. It has, after all, been a good 10 years, and once I created this conglomeration I quickly moved on to other things. I also created this at a time when I was filled with considerably more righteous indignation against all concerned parties. It has tapered off considerable over the last decade. Microsoft has long since ceased being the fearsome monolithic force the Gnu-ists would like to continue to think it is. As history now notes, two years later Apple introduced the first iPhone on 29 June 2007, during which we were entertained by Steve Ballmer’s clueless dismissal of the iPhone. Fast forward to today and Microsoft is little more than an historical footnote in mobile and is boxed into the dwindling PC market, everybody has Android or iOS smartphones, and people are now writing about how Microsoft “is the company to watch in 2016.” How far the once mighty have fallen.